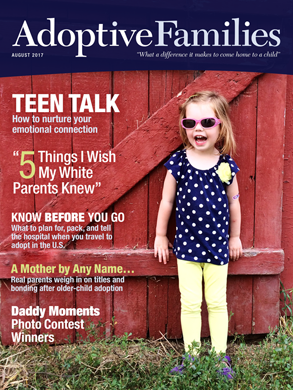 Readers share feedback about articles published in the August 2017 issue of Adoptive Families magazine. This article makes my heart so heavy. I wish the author could have talked with her parents about this, but I will be sure to use these insights to reflect on how I can better help my children and celebrate their heritage. If you are a white family and you adopt a child of color, you have been put in charge of raising a happy, healthy, and well-rounded person who knows about her whole self. You can’t expect her to be white. That isn’t how society works. If you can’t teach a child of color about her history and culture as well as you could teach about your own, maybe adopting a child of color isn’t something you should do. I don’t feel that the author was saying that white families shouldn’t adopt black children. She was simply saying that, if you do, if you want your child to integrate her family and racial identity, you have to do a little work to attend to that. That work starts by really listening to authors like Rebekah Hutson, rather than simply dismissing them with one broad stroke. Criticism is how we grow, it’s how we get better. Listen to adult transracial adoptees, or your own children will feel the same way when they are adults. Oh, man, I’m going to have to study this article before my son is a teen. I could see myself saying a lot of the things the author advises against without thinking! I think I’m going to have to read all the books about parenting teens when the time comes. As the author writes, adoption isn’t only a beautiful thing—but I don’t think any of us believe that. I don’t know a single adoptive parent who sees herself as a hero or doesn’t feel, with incredible heaviness, what it means to raise a child who didn’t come from her body. Obviously you can’t capture every scenario or feeling in one article, but I wanted to point out that the mother who revoked consent and chose to parent her son after I had had custody for nine days did not just feel happiness when she made this decision. She was terrified. She felt guilty. She was doubting her decision. She was unprepared. Now, over three years later, she still doubts her decision to raise her son. But she loves him with all her heart, and I know love is the most important thing for a child to have. I don’t mean to sound negative, but why does this the questioner feel that these children have to call her and her husband “Mom” and “Dad”? Like them, I figured my daughter would come home and, eventually, I would become “Mom.” Nope. She doesn’t like the word “mom” and doesn’t feel comfortable calling me that. My mother, however, had a huge problem with her calling me by my first name, so I talked with my daughter and we agreed that she could call me “Mim,” a name we made up together. Even after adoption day, she says that I’m not like a mom, I’m Mim—and that’s totally different. She’s had enough moms (biological, foster, social workers, teachers) that the title of “Mom” just doesn’t describe who I am in her head. And who am I to object? So I’m Mim and I’m good with that. For my daughter, the titles “Mom” and “Dad” previously went to very unreliable people. I don’t expect that she will ever call me that. There’s too much history and heartache attached to those words, particularly in older child adoptions. We fostered very young children (younger than five), taught them to call us by our first names, and allowed them to switch to “Mom” and “Dad” when they chose to do so. We had the opposite situation from the reader who asked the question, though, and they switched over super fast. Parent-to-Parent: "Do You Talk with the Teacher About Adoption?" ON THE COVER: Wes (4 months, U.S.), son of Steve and Racquel, Tennessee. Photograph by Madi Noelle Photography. "Caught on Camera: Our Surprise Adoption Match"
Can Black Children Wear Clothing with Watermelons?